Deca Technologies is an emerging wafer-level interconnect foundry built upon 10X thinking; the philosophy of striving to achieve exponential improvements over typical industry methods. Deca’s unique approach to design, equipment, processes and operational methods delivers our customers a competitive edge with short cycle time and rapid new product introduction. 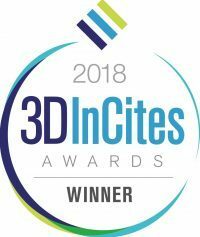 The 2018 3DInCites Awards recognize industrywide achievements in the development of heterogeneous integration technologies with categories from Research Institute of the Year to Materials Supplier of the Year. This year, Deca Technologies’ M-Series, a fan-out wafer-level (WLFO) packaging technology, won Device of the Year for its high reliability. Staying competitive in the WLCSP market is all about time. While your competitors are still waiting for new mask sets to start a product build, Deca’s 10X approach is already rolling your product off its Autoline.